Review Fix chats with Adema guitarist and frontman Tim Fluckey, who discusses his role as the band’s frontman after serving primarily as the group’s guitarist since their inception. Fluckey also discusses the band’s upcoming album “Topple the Giants,” and why their old fans should reconnect with them. Almost a new band with Fluckey at the helm, Adema is a melodic rock powerhouse, a far different lion from their days on top of the charts in the early 2000s. Review Fix: Your role with the band has changed drastically over the last three years. What has it been like to go from guitarist to frontman? Tim Fluckey: It has been a good experience for me. When it went down it was the other guys in the band who asked me to try it and had faith in me. It’s something as a musician that you ask yourself “Can I pull this off?” I approach it with the philosophy of improving everyday and putting on a show Adema fans have come to expect. Review Fix: What have you learned about yourself through this process? Fluckey: That if you believe in yourself and the music that you are making with your friends, you don’t have to be the greatest singer technically; you have to own what you are and what you can do. Review Fix: How was this album put together? What the band like creatively? How do you guys work together? Fluckey: This album came together because we had been through a few bad situations over a couple year period- dealing with outside issues. When they resolved themselves, we were ready to just lay down some new music in the studio. We decided along the way to re-record some old Adema favorites as a way to let the fans know I was capable of performing them at the level they were used to. We love to collaborate with each other; everyone in the band has diverse influences and its great to have a vision of a song and bring it to the guys and with their talent they take it to a different realm and make it better. It’s how we’ve always worked. 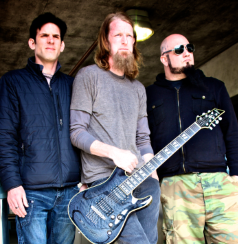 Review Fix: What do you think Adema represents musically? Fluckey: We see Adema as a melodic rock band. We have been labeled nu-metal and there are definitely elements of that in our music; that’s the scene we came up in, but in the end we have all kinds of different rock influence in our music. We really don’t set boundaries on what makes a song an Adema song; we write what we are feeling at that moment. Review Fix: How is this album different from the band’s other work? Fluckey: The new music on the record is different for many reasons, I’m singing now and it has been a few years since our last release. There is music that would be considered classic Adema, music that represents where we are at musically now and music that is foreshadowing what’s to come from us. I think it covers a broad spectrum for us. Review Fix: What do you think is the standout song on the album. Why? Review Fix: How was the song written, what was the creative influence behind it? Fluckey: It all started with the phrase “She rides the lion.”I thought it sounded cool and I was thinking, why is she riding a lion? Chicks riding lions made an interesting metaphor to me. The guitar parts where rad to me too. With they way we tune our 7-strings, I can come up with new chords and positions that just sound different no one’s playing them like that. Review Fix: What’s the promotion looking like for this album? Are you guys planning a tour? Fluckey: Promotion is looking great since we joined the good people at Pavement Entertainment. It’s run by artists who now what’s going and what best for our band and this album. We have a tour in the spring and will be on tour in the summer as well to promote the new record. It’s an exciting year for Adema and their fans. Review Fix: For fans that have lost touch with the band over the last few years, why should they start listening again? Fluckey: We are a great band who brings it every night on stage. Our music has evolved with our fan base and with each new release we are trying to do something new. We have been through many obstacles that would have crushed other bands and are still here standing strong because we still have something to say. There’s a reason for that and you should listen.